Fat-shaming is a hot topic right now, but I recently read an article about how skinny shaming is an issue too. Although the article was well written, there was a barrage of negative comments about how skinny-shaming is no where near the same as fat-shaming. I actually agree with this. The social stigma with being fat does not compare to that of being skinny. But this leads me to the bigger question of why is body-shaming in any capacity acceptable? For the sake of full disclosure, I feel obligated to share that I am not fat and have never been what would be considered fat. If I slapped a standard weight chart down in front of you, my highest weight grazed the upper level of the “normal” range for my height. I cannot speak to what it is like to be overweight let alone obese, but I can share my experiences with flirting with the underweight side of the spectrum. The skinny-shaming that came my way was pretty tame compared to the fat-shaming I read and hear about. I never was mooed at by a stranger, given a look of disgust when asking for a seatbelt extension on an airplane, or felt embarrassed when purchasing a plus-size manatee grey dress at Target when the same dress in a non-plus-size is called dark heather grey. My skinny-shaming came in the form of people poking my ribs and calling me skinny minny. Like I said, pretty tame. I think what bothered me the most was that I associated “skinny” with being unhealthy or sickly. I think of people with cancer, victims of the Holocaust, and starving children in Africa when I hear the word “skinny”. However, I can see why people think that skinny is a positive term. Let’s face it, society looks down on those who are fat. If that weren’t the case, then I wouldn’t read about people looking forward to the day when they are skinny-shamed. So what motivates people to shame others in the first place? When people shame others, a power imbalance occurs. The shamer is able to manipulate someone’s mood and actions by making that person feel flawed. Power in any form can be addicting, and body-shaming gives the shamer a sense of superiority.1 It seems to me that the motivation for the various types of body-shaming come from different sources. Loathing and disgust appear to drive fat-shaming whereas insecurity and envy appear to drive skinny-shaming.2 Either way, it’s about exerting control over others and making them feel unworthy. I remind myself of this when body-shaming happens. The issue does not lie with you or me but rather with the body-shamers. It’s not us; it’s them. When I was younger and more naive, I did look down on those who were fat. I had been taught by the media that fat was something to criticize while thinness was revered. When I lost weight in an attempt to be thin, I learned that there is much more going on that what appears on the surface. To others, I probably seemed organized, in control, and well-put-together. However, I had many underlying issues that people could not see. I now know that I have no right to comment on a person’s weight because I don’t know their back story. There may be a medical reason for someone being underweight or overweight or for having weight fluctuations. Someone may have lost weight due to an illness, and a “compliment” of “You look good! Have you lost some weight?” will only make me look like an insensitive fool. Some may have turned to food for comfort after a death of a loved one. Who am I to judge that decision in their time of grief? It’s refreshing to see someone so caring. I admire your work ethic and passion. 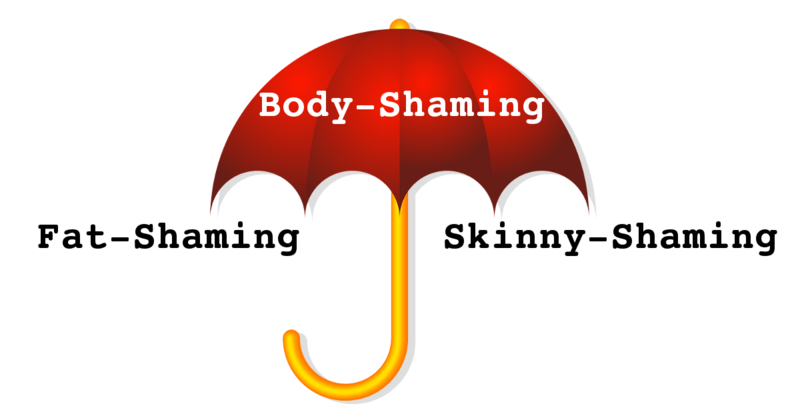 Fat-shaming and skinny-shaming are not the same, but there are similarities between the two. I will never experience weight discrimination, and I know any shaming that comes my way will pale in comparison to what a fat person goes through. Have you experienced body-shaming in your life? If you feel comfortable sharing, please do so in the comment section below. 1Thank you, Melissa Kirk for sharing about this topic in the article “Shame On You! Do You Use Shame to Control Others?” in Psychology Today. 2I could be totally wrong here, but that is my impression. 3Though I wish I could take credit for this quote, I can’t. It was posted on Pinterest anonymously.